Fusion GPS founder Glenn Simpson was in contact with a State Department official who had close contacts with dossier author Christopher Steele, according to emails recently obtained by The Daily Caller News Foundation. 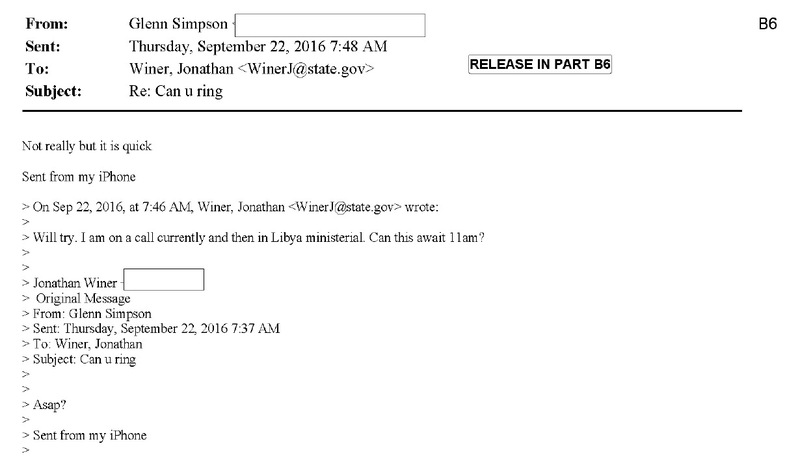 The September 2016 emails show Simpson was desperate to make contact with Jonathan Winer, a longtime associate of then-Secretary of State John Kerry. Winer has been confirmed as a source for an article published the following day. That article, written by journalist Michael Isikoff, was the first to publicize Steele’s claims about Trump campaign adviser Carter Page. One of the co-founders of the opposition research firm that commissioned the Steele dossier was in contact with a State Department official in the days before a news article was published laying out allegations contained in the salacious anti-Trump report. Emails obtained by The Daily Caller News Foundation show that Glenn Simpson, an executive at Fusion GPS, contacted Jonathan Winer, who then served as State’s special envoy for Libya, on Sept. 19 and Sept. 22, 2016. That was days ahead of the publication of a Yahoo! News article that was the first story to cite information gathered by Christopher Steele, the former British spy who authored the dossier. Winer, a longtime aide to former Secretary of State John Kerry, was a source for that article, which laid out Steele’s allegations about Carter Page, a former Trump campaign adviser who would become the target of FBI surveillance. The emails, which were obtained through a Freedom of Information Act lawsuit filed on TheDCNF’s behalf by Judicial Watch, show for the first time that Simpson had direct contact with a State Department official. Simpson, a former Wall Street Journal reporter, sent an email on Sept. 19, 2016 asking Winer if he was in town. “For a couple of hours,” Winer replied. “Will try…Can this await 11am?” Winer responded. “Not really but it is quick,” said Simpson. The emails do not indicate whether Simpson and Winer spoke or met. Winer did not respond to a request for comment. But a day after the final email exchange, Yahoo’s Michael Isikoff reported that federal law enforcement agencies were investigating Page over possible contacts he had with two Kremlin insiders, Igor Sechin and Igor Diveykin. Isikoff would reveal in a book published with co-author David Corn that Winer vouched for Steele as part of his reporting for the Sept. 23, 2016 article. Winer was also a source for an article that Corn published on Oct. 31, 2016 for Mother Jones that anonymously quoted Steele. It was not known until 2017 that Steele was a source for Isikoff. Prior to that, it was widely believed that Isikoff’s report independently confirmed allegations made in the dossier. Page, an energy consultant, has long denied Steele’s claims, saying that he has never met Sechin or Diveykin. The FBI relied heavily on Steele’s dossier in four Foreign Intelligence Surveillance Act (FISA) warrants against Page. Isikoff’s article was also cited in the applications, though the FBI did not disclose that the report was based on information provided by Steele. Congressional investigators have looked into Winer and the State Department’s role in handling the Steele information and other intelligence used in the FBI investigation of the Trump campaign. Republicans have long been puzzled over information that flowed through Foggy Bottom prior to making its way to FBI investigators. 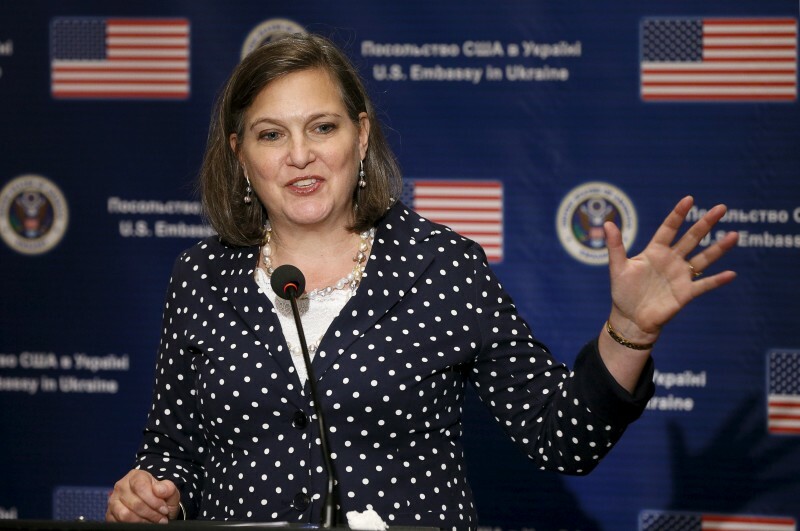 Victoria Nuland, who served as assistant secretary of state for European and Eurasian Affairs, approved a July 5, 2016, meeting between FBI Agent Michael Gaeta and Steele in Rome. Fusion GPS had hired Steele just weeks earlier to investigate President Donald Trump’s possible ties to Russia. The ex-MI6 officer wrote his first of 17 dossier memos on June 20, 2016. That document alleged that the Kremlin had blackmail material on Trump. The new emails raise the possibility that Simpson made contact with Winer as part of Fusion GPS’s media outreach operation. Fusion was paid $1 million by the law firm for the Clinton campaign and DNC to compile anti-Trump dirt and disseminate it to the press. Through Fusion, Steele met with Isikoff, Corn, and reporters from The New York Times, Washington Post, CNN, and New Yorker. Winer has publicly acknowledged his interactions with Steele, but he has not addressed his contacts with Simpson. In an opinion piece at The Washington Post on Feb. 8, 2018, Winer said that he has known Steele since 2009, when Steele left MI6 to form his private intelligence firm, Orbis Business Intelligence. Steele provided Winer with more than 100 reports based on intelligence he picked up on behalf of his private clients. Winer shared many of those reports with other State Department officials, including Nuland and Kerry. Judicial Watch is representing TheDCNF in a lawsuit seeking those reports from Steele and Winer and Nuland’s communications regarding the dossier. Winer wrote that Steele told him about his Trump-related investigation in summer 2016. And in September 2016, the pair met in Washington, D.C. There, Steele showed Winer memos from his dossier. Winer prepared a two-page summary of that information and shared it with others at State Department. Nuland told the Senate Select Committee on Intelligence on June 20, 2018, that Steele met with State Department officials in October 2016. Winer also handled another dossier on Trump that matched up with some of the salacious claims made in Steele’s report. Sidney Blumenthal, the Clinton crony, gave Winer a dossier on Trump that had been compiled by his and fellow Clinton insider, Cody Shearer. The so-called Shearer memo contains some of the same salacious allegations about Trump’s activities in Moscow. Winer has acknowledged that he gave the Shearer memo to Steele, who in turn provided it to the FBI. The State Department has previously declined comment on Winer’s activities. He is now a senior adviser to APCO Worldwide, a global public relations firm.